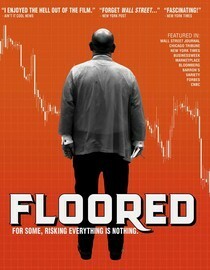 Floored is the story of the traders working in Chicago's futures markets. It seemed like it would be interesting because I've always wondered how it worked on the floor as well as what all those guys with yellow jackets walking around downtown did. It also seems like it would be an industry filled with larger than life characters... and it is. Unfortunately, the characters they all seemed to be playing were larger than life scumbags. There wasn't really a likable one in the bunch. Aside from one woman, they're all a bunch of white, male, self-entitled assholes who do nothing but complain about computers and how good the "good 'ol days" were. There is nothing wrong with this documentary per se, it's more that there is something wrong with the people this documentary is focused on. I guess to some it would be interesting enough, but listening to people who have made and lost millions of dollars doesn't really do anything for me. Especially when they didn't really add anything positive to the world in the process, they were just gamblers. If you have an interest in this sort of thing I guess it's worth checking out, but be prepared to be annoyed. According to Netflix this movie will stop streaming on 4/8/13. Of course, sometimes they lie. Why is it in your queue? I figured there would be some pretty interesting characters in the floor trading game. Mostly they were just whiners though..
What stood out the most to you? Every one of them smokes cigars. What mood should I be in to watch this movie? In a mood to learn about liquidity.